Having just finished Psycho-Pass, switching back to Shinsekai Yori still felt like shifting to overdrive. Psycho-Pass is powerful because it touch one of the most ugly yet intriguing question that is crucial to the well being of our existing human society by question what would the society become if it were to be transformed into something else. Shinsekai-Yori on the other hand, not only does it touch the topic, it completely shatters it, and looks beyond to see what could have come of it if the every member of the society itself has become something else. 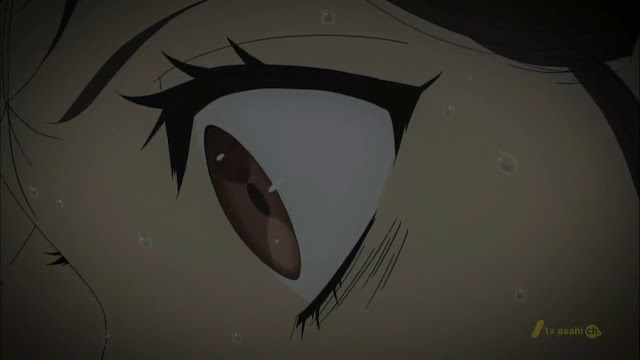 Shinsekai Yori is not a character driven story, rather, it's almost purely driven by event. However, that doesn't mean there's lack of character development. In fact, character development is one of the most interesting part of the story, where you see a group of kids slowly mature through some quite traumatizing experiences, even when they all have supernatural powers. Throughout some dark and twisted and often creepy encounters, these children, who grew up as normal human in a society where psychics are the norm, are tested to a rather extreme level, where they have to choose to submit themselves to these rules of the society which they're yet to understand and could potentially bring the doom of their own fates or rebel against them while facing possibly even riskier consequences. The forbidden fruit of knowledge in this new world is highly tempting, but, it comes with a dangerous and often deadly consequence. The the mechanical build of this new world is indeed intriguing. For starters, it's like every single member of the society are deadly weapon themselves where killing others is no more difficult than moving your eyeball. Yet, through some complex schemes, orders are kept so people can't just go slaughter everybody at will. But like any complex machinery, more moving parts there are, harder to keep the machine running without constant breakdown. This story describes exactly what happens when the crucial element of this system breaks down. Mechanically, the lack of opening theme song along with the very fitting Dvorak's No.9 Symphony "From New World" as background music creates a perfect environment where you're dropped in this dark and suppressive world from the beginning to the end of every single episode. You almost never ever even have any breathing time. It is indeed a masterpiece.